We are happy to announce that, with two other Dutch productions, Cake (a.k.a. Taart) and Boys (a.k.a. Jongens) are nominated for an Emmy Kids Award! Cake is a nominee for the category Best TV Series. The series tells the story of the eight-year-old Kadir who wants to make his father happy again after losing his wife. In order to do so, he makes it his mission to make sure everyone tastes the wonderful cakes his father bakes. The series has been raved about as well in The Netherlands as internationally. The bond between father (Gürkan Küçüksentürk) and son (Harvey Elgood) is undeniable and their chemistry makes the story even more real and pure. 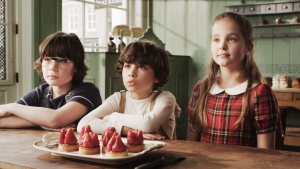 The style of the series has been compared to the French movie Amèlie, which contributes to making it worth watching for both kids and adults. Boys is about two star-crossed teenage lovers and competes for Best Television Film. The film had been rewarded for the rawness of its story and the relatable emotions the characters go through. Supporting the young actors Gijs Blom, Ko Zandvliet and Jonas Smulders, is Ton Kas, who was praised multiple times for his role of the well-intended father, for which he won a Golden Calf at the Netherlands Film Festival of 2014. The film had been picked up by the US, the UK and Germany amongst others. We cannot be more proud of both of Boys and Cake and it would be amazing to add an Emmy to either one of their trophy cases! We will find out in April 2016, when the Emmy’s will be awarded in Cannes.